• Isn’t ITIL the same as ITSM? • What should I consider before starting an ITSM implementation? • What kind of training do we need? How much training? • Where can I hear about others’ ITSM experiences? • Should I get tools or develop processes first? • Do I need consulting help? • Why do ITSM projects fail? • May I ask you a question? 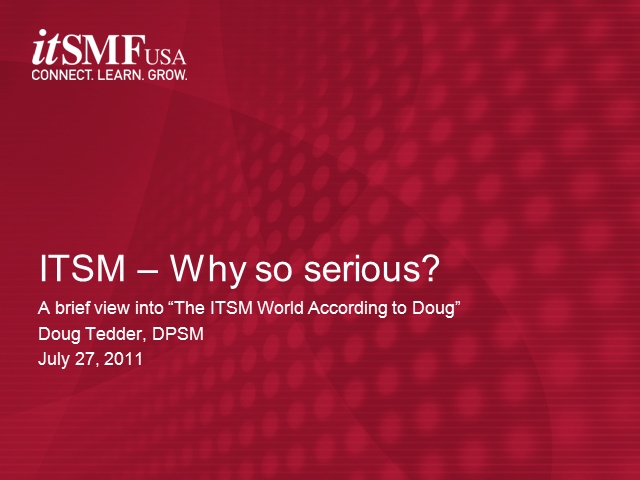 Title: ITSM: Why So Serious?